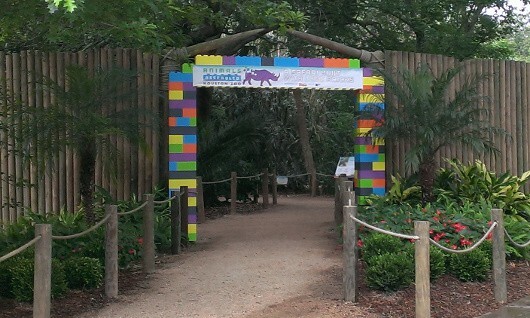 This summer, from Memorial Day to Labor Day, the Houston Zoo is featuring Animals Assembled: A Safari Built with LEGO® Bricks. There are 10 species and over 2 dozen animals constructed of Legos. 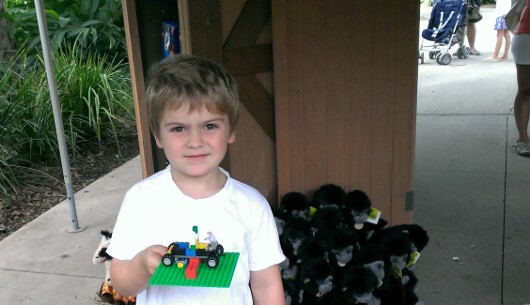 The BigKidSmallCity crew happens to love Legos. 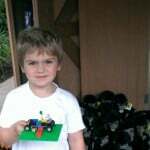 We were unable to attend LegoFest at Reliant, so to make up some lost points, the kids and I went to Animals Assembled on opening day. Animals Assembled is free with zoo admission so no special ticket was required. Inside the zoo, we headed towards the birds and saw a big Lego block pointing us in the right direction. We easily found the Lego framed entrance and went along the winding path. Joe was excited to snap pictures and look at all he creations. There are a lot of Legos! 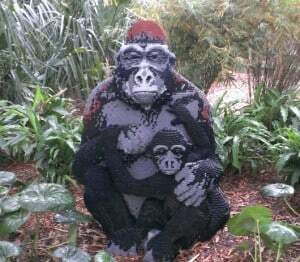 The Gorilla and Baby were made with 35,000 bricks! We saw a tiger, gorilla, penguins, fish, giraffe, lemurs, rhinoceros, zebra, hornbills, toads and flamingos. 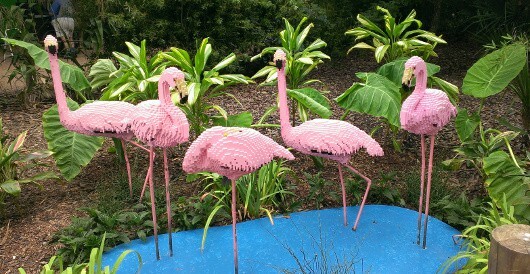 Brooke and I liked the flamingos best. Joe liked them all but was really really hoping to build his own creation. At the end of the path, there is a place to get your picture taken. So you are ready, this is a photo you can buy. We skipped this and walked out to the little gift shop. We were pleased to find a little table where kids can build with Legos. 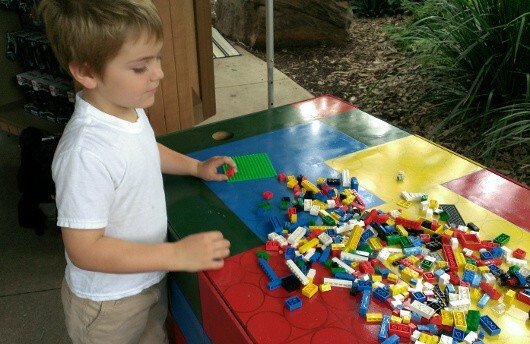 This table is small and there weren’t that many Legos, but it was enough to please my 5 year old. Fortunately, at 9:00am, we did not have any competition at the table and Joe was able to find all of the pieces to build a little truck and repair shop. When asked later, this was his favorite part of the exhibit. In fact, he has asked to go back each day since. Since Animals Assembled is free with zoo admission, I don’t have a problem with this! Go check out Animals Assembled this summer and tell us what yo think.